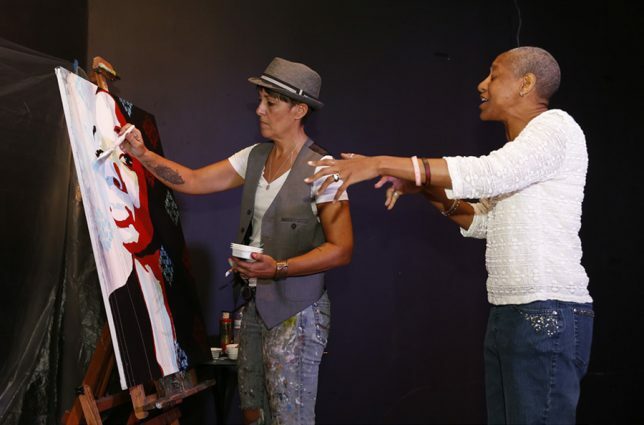 Thou Art Woman has grown from an open mic night to a three-day art celebration. By Christiana Lilly. EsOh, G Wright Muir, Richard Wright, Erin Lee and Tabatha Mudra; Attendees of Thou Art Woman 2018. When Ghenete Wright Muir came out as a gay woman, after years of being married to a man, she was looking to connect with people like her. People who enjoyed visual art, poetry, music, spoken word. But there wasn’t a space like that for LGBTQ women. So, Wright Muir decided to change that and created Thou Art Woman. “Thou Art Woman really took to fill a void in the lesbian and queer woman community, for the LGBT women community. An alternative space for us to be ourselves, really,” says the cofounder. With it’s fifth year having just been completed, Thou Art Woman has grown from an open mic night to a three-day art celebration. It all began in the summer of 2014, when Wright Muir and some friends organized an open mic night at 1310 Gallery in Fort Lauderdale. 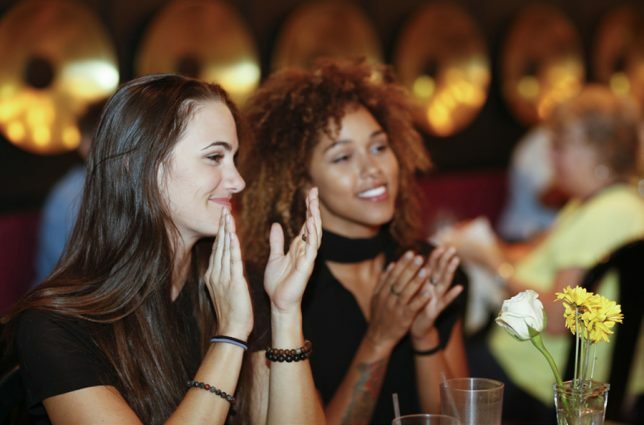 Her friend dubbed it Thou Art Woman, a free event that welcomed everyone and was so successful that people asked for it to be a monthly gathering. Wright Muir opted to host it a few times a year and it only grew in popularity, forcing them to move from the small gallery space to the ArtServe auditorium. This past year, it expanded for the first time to a three-day event, with the open mic night held at the Broward Center for the Performing Arts’ Amaturo Theatre. This year’s Thou Art Woman-falling in Women’s History Month- opened at the Riverside Hotel with a LGBTQ Business Roundtable Breakfast. That evening, March 1, was the opening of “At the Edge,” a visual art exhibition curated by Dr. Sarah Clunis of Xavier University in New Orleans, at 1310 Gallery in Sailboat Bend. Thou Art Woman partnered with Equality Florida, Broward Cultural Division and Old Dillard Foundation to present the Business Roundtable. The second night, open mic night, has grown in scale so much over time due to it’s popularity that people had to submit their work ahead of time for a chance to be selected and to keep the original event spirit alive. Wright Muir and Nik Harris hosted the evening at Broward Center, and featured performers including May Reign the Poet, Rebecca “Butterfly” Vaughns, DA HAUS, TheePoeticTruth and Inez Barlatier. The weekend came to a close with “Brunch With Us” at the Riverside Hotel in downtown Fort Lauderdale, a relaxed meal where speakers, performers and guests from Thou Art Woman were encouraged to interact and reflect on the weekend, with Lady of Harp performing. The annual Thou Art Woman is not only a weekend to celebrate the arts, but also an opportunity for Black LGBTQ artists to prosper. The morning of March 1, Equality Florida hosted an intimate roundtable discussion focusing on black LGBT entrepreneurs. 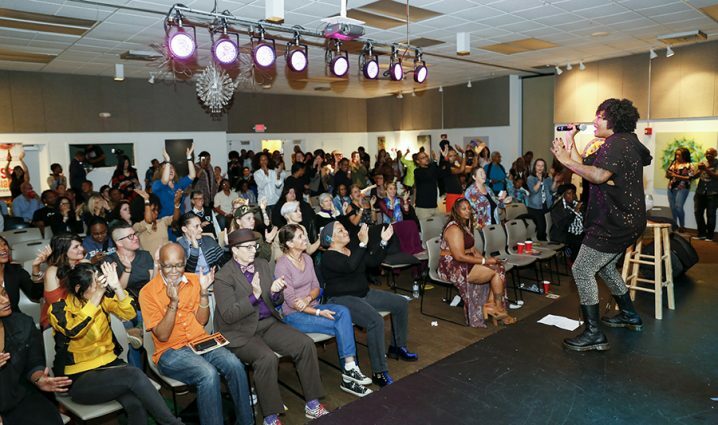 The goal was to connect the business community in Broward County and create a place where Black LGBTQ people can thrive. While the “At the Edge Exhibit” was a space created for the 14 artists to showcase their work, most importantly, it was also an opportunity for them to sell their pieces. 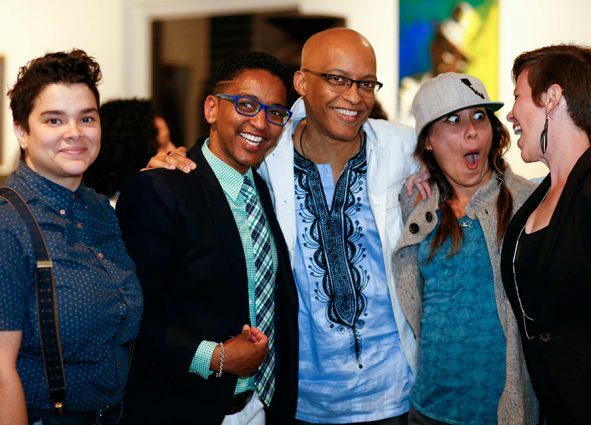 The goal is for artists to be successful, which also continues a mission of Equality Florida’s, called Equality Means Business, where they press the importance of diversity and inclusion in “drawing top talent” to Florida’s economy. “They don’t want to be starving artists, they want to be artists, and so we hope that this can make connections, open doors, increase possibilities, and have the visibility to draw people to our state,” Smith says. > For more information, visit thouartwoman.com.